Something that Mandy & I have been meaning to do for ages and have not got round to…….till now, is somekind of secondary double glazing on the double hung timber windows that we have in the main part of the house. When we first moved in we spent some time sealing the draughts and rattles in the windows and doors which made a big difference. Now it was time to trial a product which creates a secondary glazing panel at a low cost. There are a few different options available to secondary glaze existing windows. I have just done a quick google and three jump out. Magnetite, Ecoglaze, and Clear Comfort . All three are very different products and you should research all three to see which suits you. We decided to go with Clear Comfort as it was a reasonably cheap option that we could do ourselves. We also spoke to other people who had used this product with great success. Found a great resource on the internet GIY (Green It Yourself) a great resource that shows with a series of videos how easy it is to make your home more sustainable with reasonably priced products and a little elbow grease. It is being put together by Lish Fejer who was one of the presenters on ABC TV’s Carbon Cops. I have found it very useful. 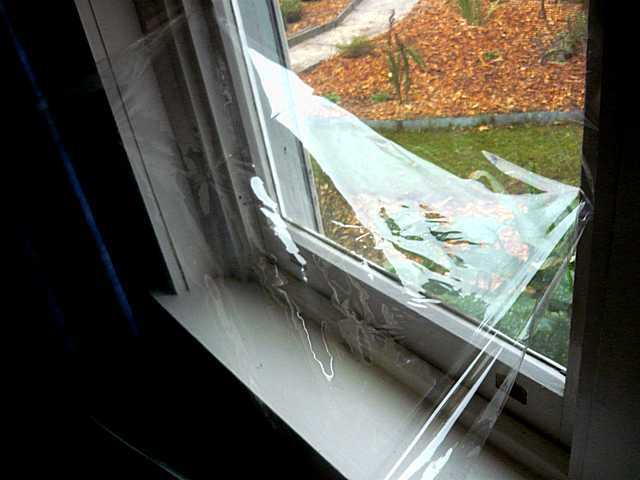 Clear Comfort is a transparent plastic film that is attached to the window frame by very strong double sided tape. When it is heated with a hairdryer it goes taut. 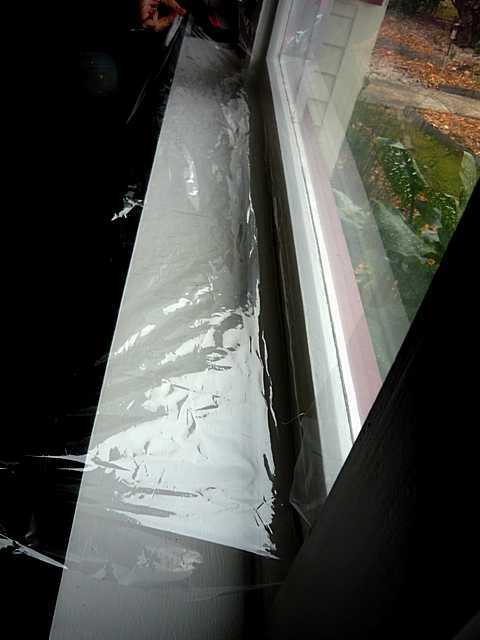 The film traps a layer of still air between the glass and the plastic which acts as an insulator. It is at present $198.00 for 10 meters x 1.6meter wide and the tape. this includes postage. If you want a clear explanation of glazing and thermal performance then this link to the Home Technical Manual, an Australian government initiative, and in my mind a bloody good one is worth a look. We decided to fit it in the lounge room first as we have south facing windows with two double hung windows and a large glazed panel inbetween. Mandy & I cleaned the windows thoroughly and followed the instructions in cleaning the paintwork on the window frames. This took a while as we had mould where the condensation had been running down the windows onto the window frame. 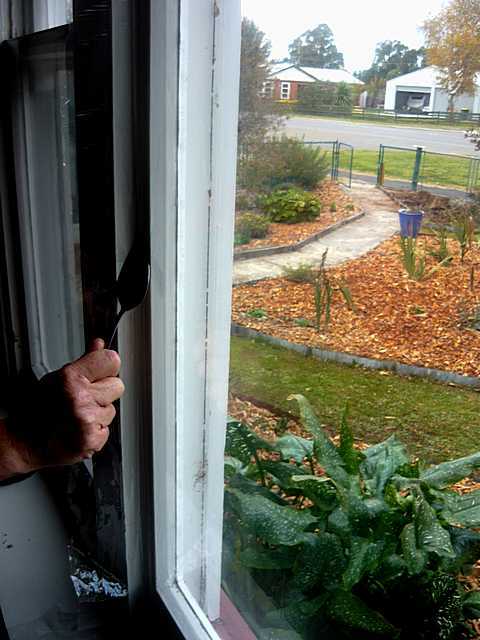 Then the tape was cut and stuck to the window frame and burnished with the back of a spoon. Note if you want to take it off again you have to order “temporary” tape not “permanent” tape. Next we cut the film to size with about a 10cm overlap. Pulled the second side of the backing tape off and gently attached the film. Working our way down we gently pulled the film until all the creases were taken out. When we were happy we rubbed the film onto the sticky tape and then burnished hard with the back of a spoon. Lastly we turned on the hairdryer and gently warmed the Clear Comfort as per instructions. The wrinkles magically disappeared and the whole thing went much tighter. Very last thing was to trim off the excess. END RESULT: Very very pleased. The room is much warmer and there is NO CONDENSATION!! Along with our floor length curtains and pelmets we have transformed a draughty south facing room into a livable room.finished apart from trimming excess. The only tricky bit has been with the upper double hung windows as these have the sash window catches. Clear Comfort suggests putting it on the outside if there is good eave coverage. 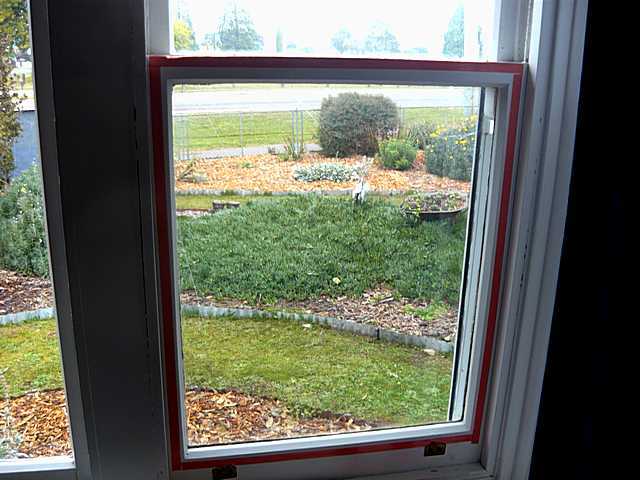 What we chose to do is to remove the catches and we will install a barrel bolt on top of the bottom window (the only one that moves in our case) that locks across into the side of the window frame. Hi there. This blog is great. I’m also calling kev for some fluff and I’m ordering some of this plastic. Forgive me if this is too forward. would you mind if I came to visit. I’d love to see this installed and get some advice before I attempt it myself. Well done for choosing ClearComfort – a brilliantly simple and effective solution. We were intending to use this on some of the windows when we build at Collinsvale, but we have found out that now all windows in new Tasmanian houses have to be double glazed – so lots more research to do!